Description: From 2 to 6 inches tall. With only basal leaves, spotted brown. 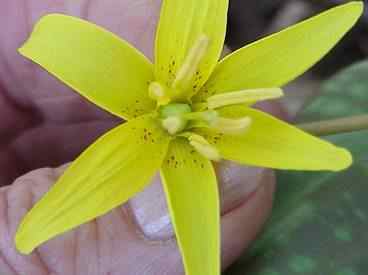 Also known as trout lily because it blooms at the start of trout season, or Adder's tongue because of a fancied resemblance of the stamens to a snake tongue. 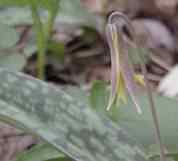 Fawn Lily is another name, appropriate because of its dappled leaves. 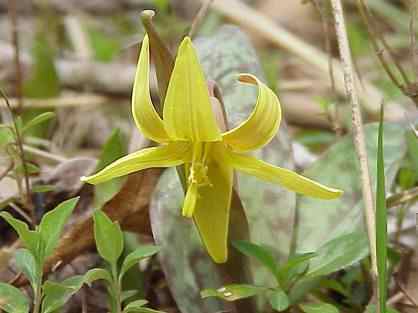 Flower color may vary from yellow to yellowish brown, pink or occasionally white. 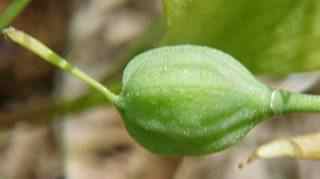 These plants are usually found in rather large colonies.